Of the two friends I’ve spoken to who I know intend to vote ‘Yes’ in the forthcoming Scottish Referendum, one by his own admission has never done a proper day’s work in his life, and the other, by his own admission, is a racist. I’d add that they have some redeeming factors as well, of course :-). 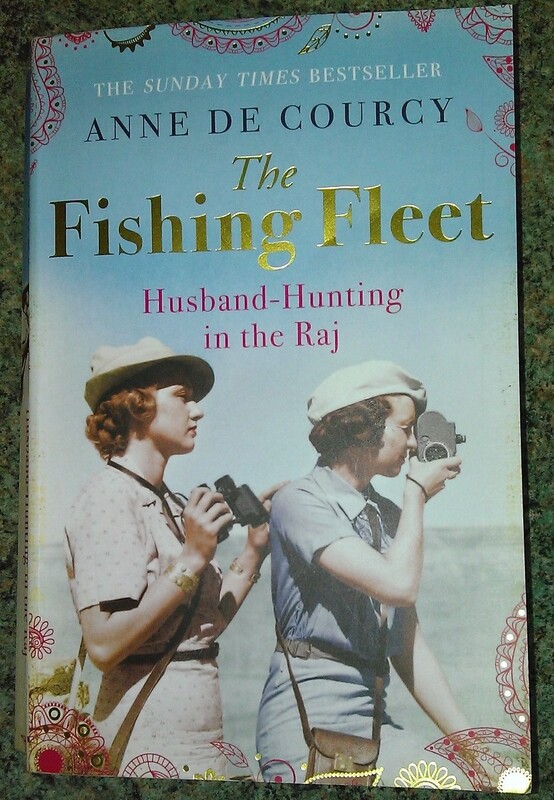 The subtitle of The Fishing Fleet, by Anne de Courcy, is: Husband-Hunting in the Raj, and that’s what the book is about – the story of eligible single women who travelled to India during the period of British rule there in order to find husbands. There were many of them, and most seem to have found romance in the male dominated country of their adoption. In those days, British women in India tended to be subsumed into their husband’s professions and interests even more so than in the UK. Their social ranking was entirely dependent on their husband’s ranking and seniority. They could find themselves initially enjoying rounds of parties, dances and shooting expeditions, but once married they might end up following their husbands to far away locations. It was normal for any children to be sent back to Britain to be educated, and without work of any kind, it must have often been a lonely existence for many women. 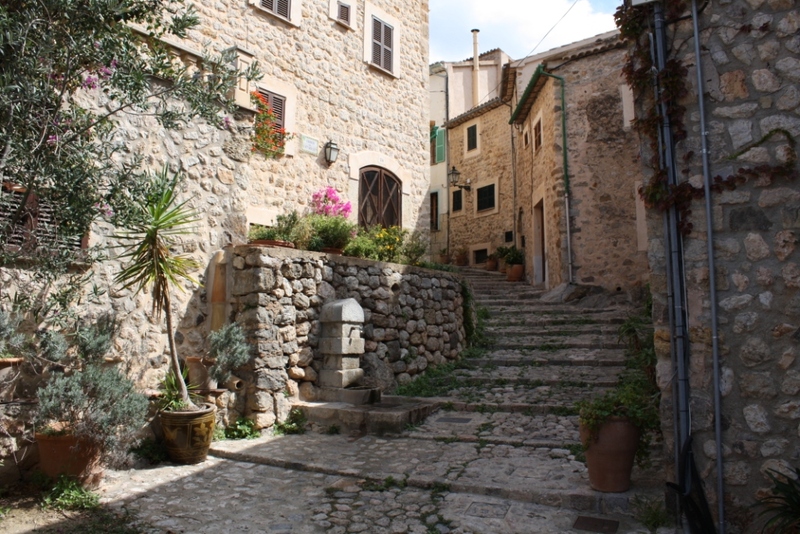 It was also regarded as being not the done thing to mix in any way with the locals – the idea being that authority could only be maintained by strict separation from Indian society. It is easy to criticise such colonial attitudes today. Most of those who went to India from 1800 onwards, and who faced all sorts of hazzards, did so not in the expectation of great wealth but because, for whatever reasons, they saw it as a sort of duty, and perhaps also as an adventure. Most history books don’t deal with the personal level as much as this one does, so it has been fascinating to read about matters of the heart, with many examples of lasting relationships of the past. After camping at Boat of Balliefurth, the next day we canoed to the bridge at Grantown-on-Spey. Dave wanted to get a good look at the next bit of river, which was very choppy with no eddies. 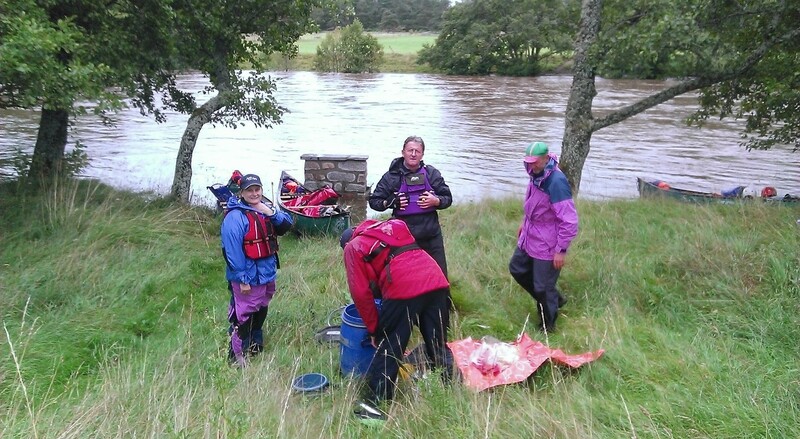 If anyone had fallen in, they would have been carried downstream a long way, so he phoned for a minibus and we loaded the canoes and kit on a trailer and drove to Cromdale, where we had lunch. We spent the afternoon canoeing from Cromdale to the campsite at Cragganmore, which is beside the old Ballindalloch Railway Station. 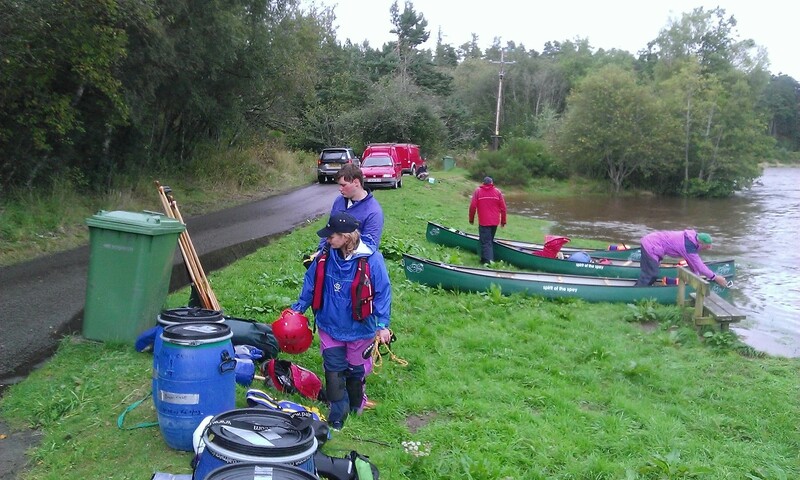 It took quite a bit of effort to carry all of the kit, but not the canoes, over a field and up to the campsite. Wikipedia has an entry about the Strathspey Railway, which used to run through Ballindalloch and was used by passengers as well as whisky trains. 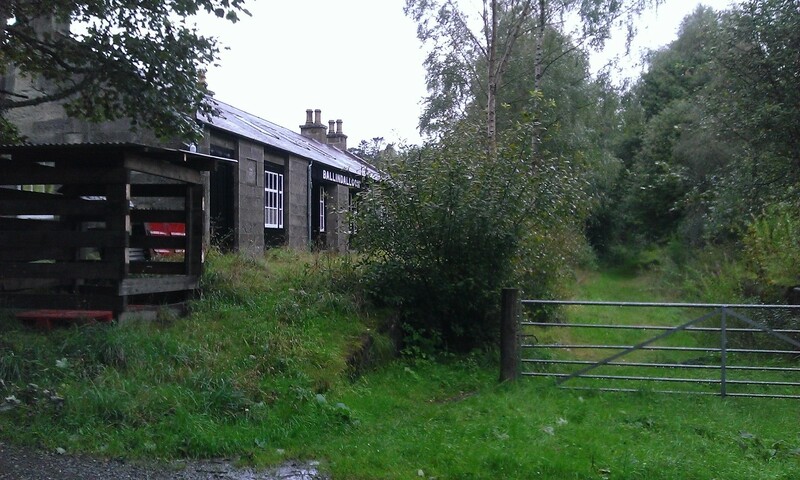 In the above photo, the gate is across the old railway line. I was not particularly looking forward to the next day, which included a section of the river known as the Blacksboat Rapid, or “The Washing Machine.” This is Grade II in normal levels, and harder in high water. “One of the most famous rapids on the Spey, consisting of a Grade II ramp between shingle banks with a long bouncy wave train. Open canoes regularly swamped here.” Here’s a YouTube video of some people going down it, and falling in, when the water was low. 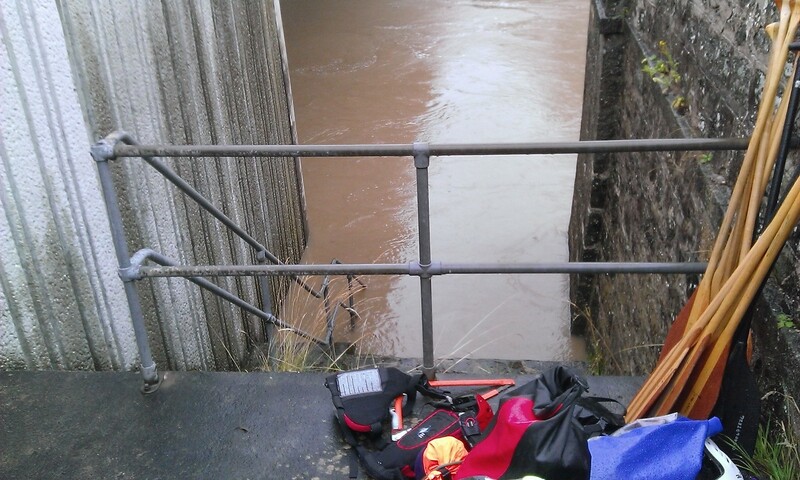 What a relief when Dave decided that the river was too high and that it was best to miss it out! 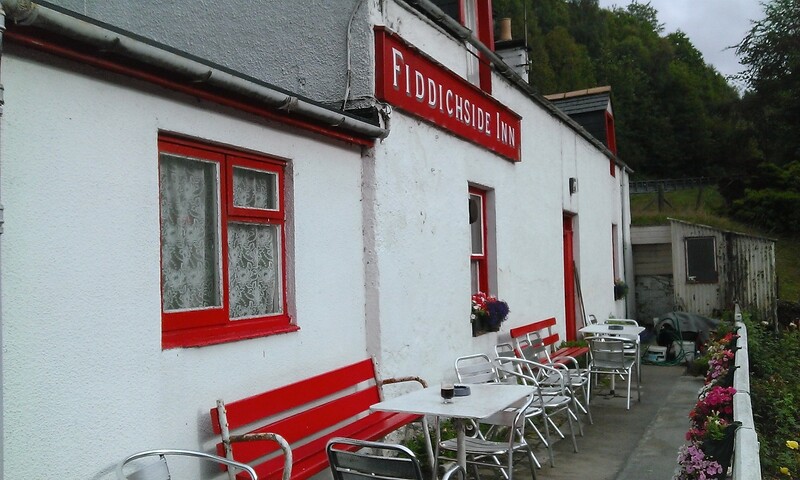 We ended up portaging the kit up to the road, and the minibus came and took us to the campsite at Craigellachie. Even though it rained quite a bit during the night, the level of the Spey was down the next day, allowing a final push to the sea. 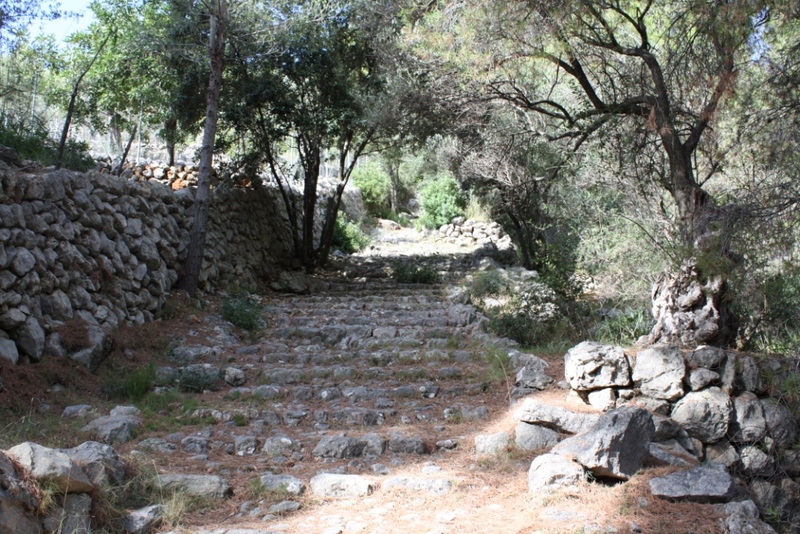 No two descents are the same. In the morning, instead of carrying everything some distance along a track and then down to the Spey, Dave decide that it was possible to do a first, a put in on the River Fiddich. 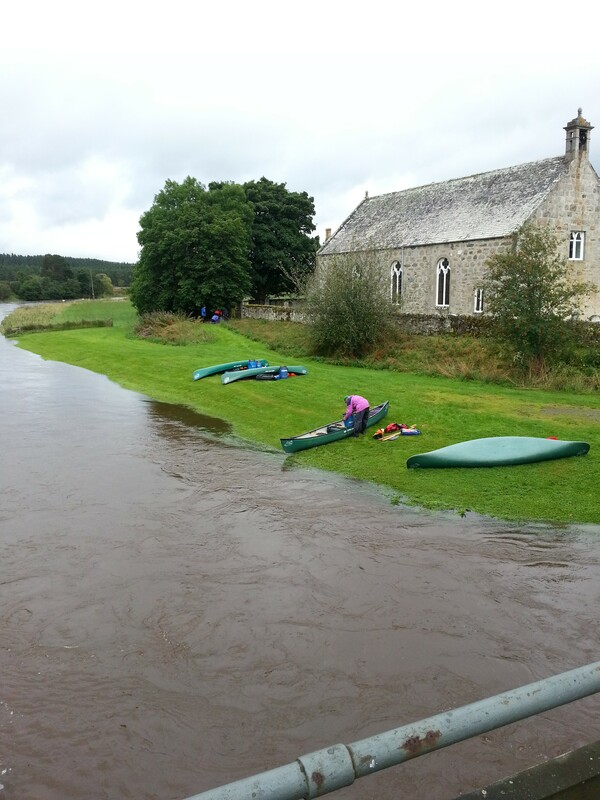 Canoeists are up for anything! 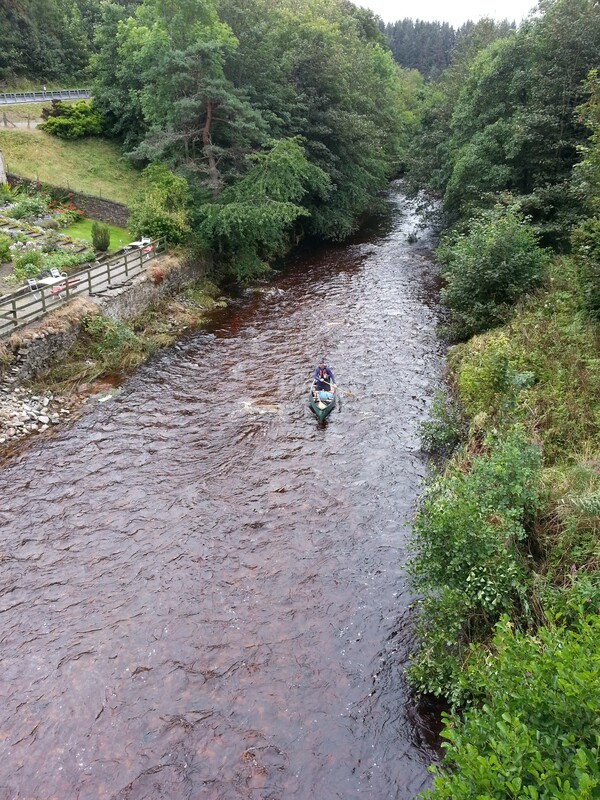 Dave got some ropes out and we lowered his canoe down a steep bank and over a fence to the Fiddich. 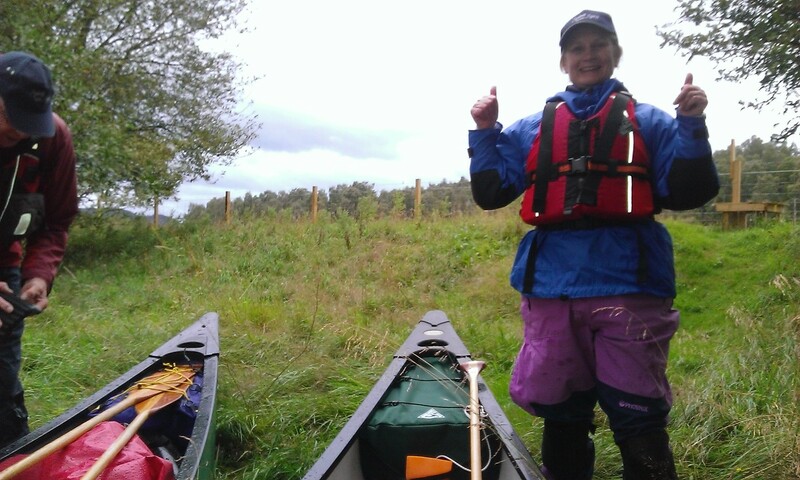 From Craigellachie it was quite a long, but very interesting day’s paddling until we eventually reached Spey Bay, and the sea! I can’t remember the last time I felt so relieved. It was a great trip, though. I can hardly imagine how good it would be if it didn’t rain for five days. In my previous post I asked what I should have indicated, by sign language, to the lad who was in the water, holding onto a tree. At the time, I assumed that he could not get out of the river, and I indicated that he should wait where he was. In later discussions with Dave, the guide, it turned out that the right thing would have been to have indicated that he should let go, turn onto his back, and float downstream until he ended up in an eddy or could make it to a bank with no trees. In the event, his father, who had managed to get out of the water, walked upstream and helped the lad onto dry land. By this time he was pretty cold. Lindsey and I ended up getting a lift in the local estate manager’s bakkie, me in the back along with some pheasant cages, up a track to our campervan, which had been left at one of the possible get out points, and eventually everyone managed to get back to the hotel we were staying in, and dried out. The weather was a bit better the next day, which was just as well, as this was the start of our attempt to canoe all the way to Spey Bay, camping on the way. We put in at Aviemore, down by the golf course. This time we were two to a canoe, and carrying everything (tents, food, clothes, etc) we needed for four days on the river. The food and tents went in blue waterproof barrels, and other things in dry bags. 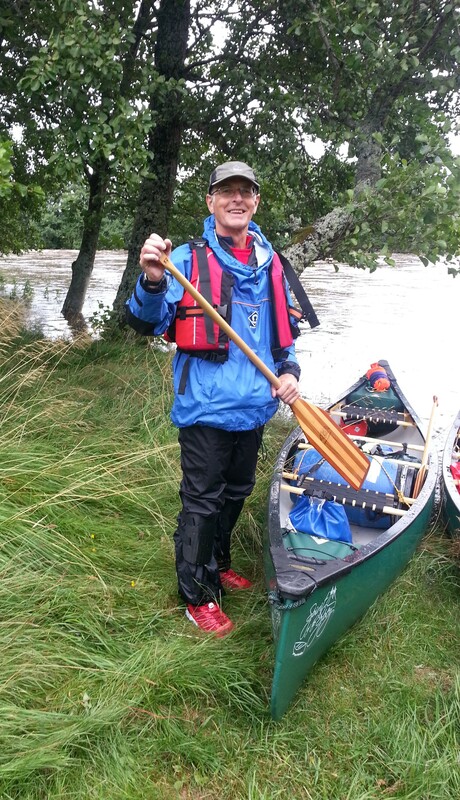 Although the river was still very much in spate, canoeing was easier on this stretch of the river. 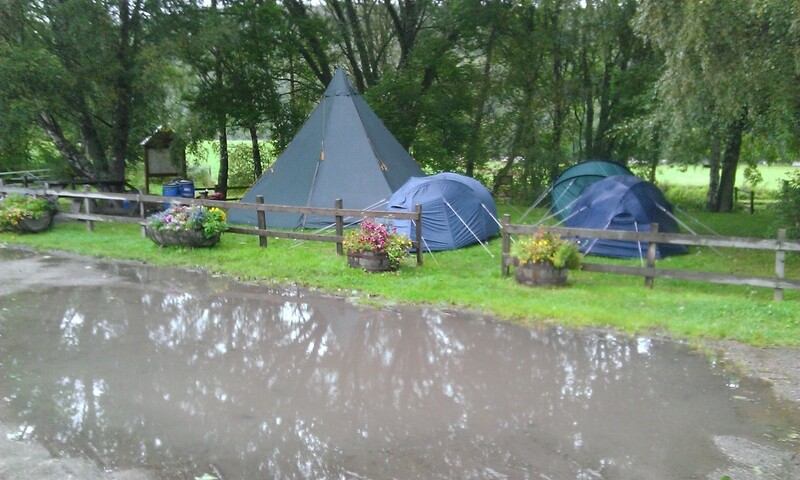 The camp site at Boat of Balliefurth was rather flooded, but we found some dry ground and pitched the tents. Spirits were high as no one had fallen in, and there was a hot water tap up the road! Spirit of the Spey provided the two-man tents, and the food throughout the trip was good, with plenty choices. We ate in the bell tent, and each day the barrels became lighter and easier to carry. You may have noticed that I didn’t take any photos of us actually canoeing. This was because I was too worried about getting my phone wet. Also notice how happy Lindsey looks in every photo, on this At One With Nature trip. In February 2013, Lindsey and I spent a morning kayaking on Loch Tay, and enjoyed the experience so much that in June of that year we enrolled in a three day sea Kayaking course in Applecross. Two very different experiences – Loch Tay was calm, and kayaking on it was a lot easier than in the sea. Since then, we’ve had a couple of hours Kayaking at Kinloch Rannoch, and a lovely afternoon kayaking in Grenada. 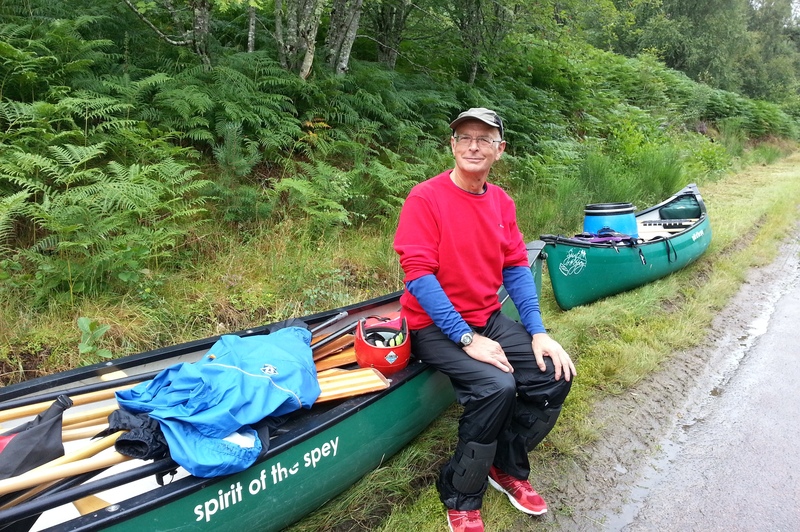 To expand our knowledge further, and for a bit of an adventure, we decided this summer to canoe down the Spey, with the help of Dave Craig from Spirit of the Spey. 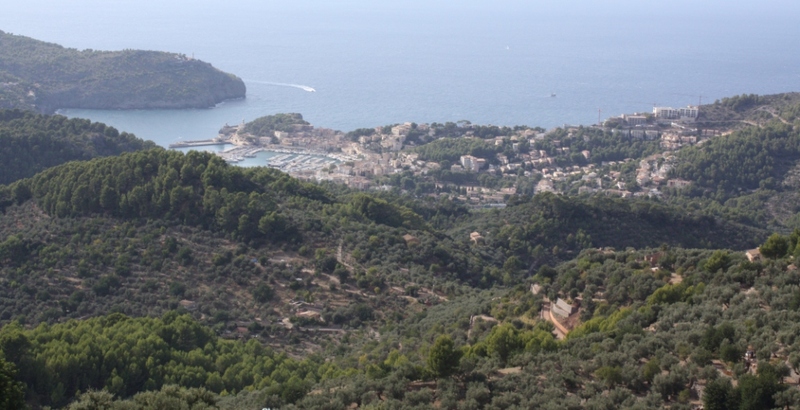 We went on his “At One With Nature” course, a 60 – 70 mile canoeing expedition, camping out and eating alfresco, and were joined by my sister, two people from Holland, and a chap from Edinburgh. Although the weather, after a glorious summer of sunshine, turned bad two days before we set off (thanks to hurricane Bertha reaching the UK), and the river was very much in spate and we were wet a lot of the time, the trip was an experience Lindsey and I would not have missed for the world. It was quite intense on several levels. You’re immediately immersed in a new group situation with several people you’ve not met before, but everyone is ‘up for the trip’. Then there’s issues about selecting the right kit – Spirit of the Spey provide all of the canoe and camping equipment you need, and you’re given a large dry bag for personal effects and a smaller dry bag for things you may need during the day, but as you’re going to be away for several days you wonder whether you’ve got everything that you need. 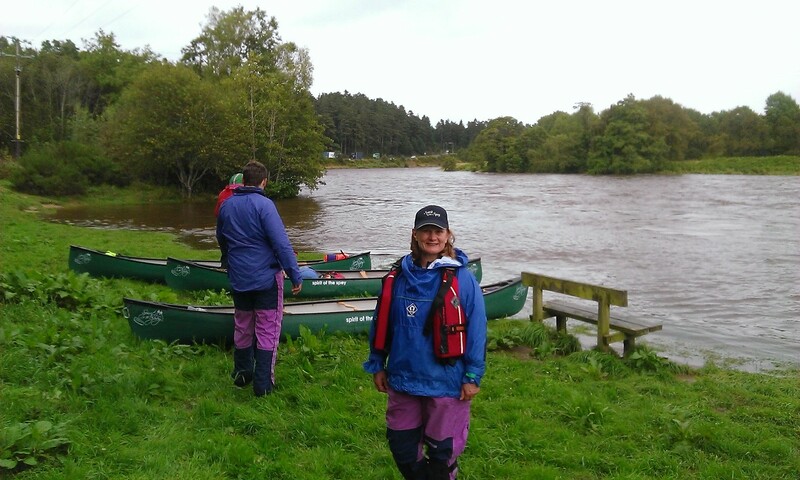 Then there are all of the new experiences – walking around with waterproofs, buoyancy aids, knee pads, a paddle, a helmet, and getting to grips with the canoes and the various paddle strokes. You might think that there can’t be a great deal to canoeing – you just paddle – but you’d be wrong. If you cast off from the bank into a river in spate and mix up your pry with a draw (as I did the very first time), it can cause problems. Then there’s all the interesting information about the Spey, the Spey valley, and the goings on at various parts of the river, that Dave tells you about. I reckon we learnt a great deal about the Spey, the estates, the distilleries, the old railway line, fishing, wildlife, the people who live beside the river and so on. 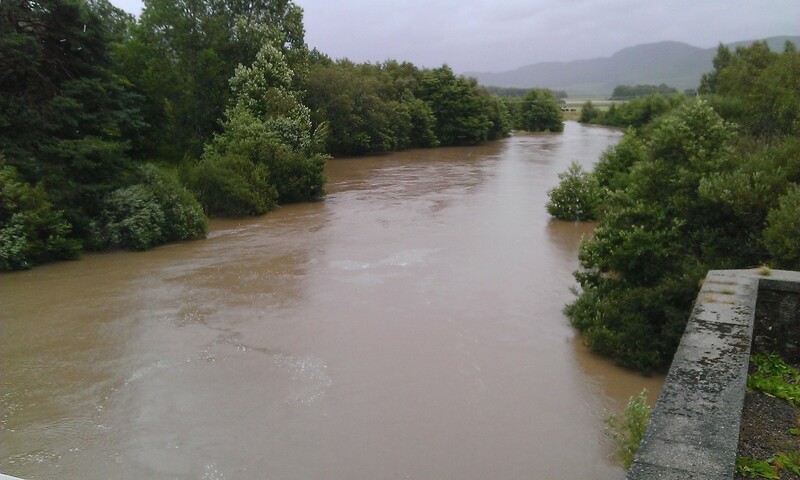 The River Spey was several feet higher than normal when we set off. This can be both good and bad. It’s good in that most rocks are submerged, but it means that the water flows much faster at certain points, that trees are likely to be half submerged, and that calm parts of the river seem to turn into raging torrents with surprisingly big ‘waves’. For safety reasons, eddies are important. At a couple of points in the trip the river was so much in flood that there were no eddies for considerable distances, and if someone had fallen in, they might have been dragged downstream a long way with no chance of reaching the bank. So, we avoided these stretches. This was the first put-in spot at Laggan Bridge. Not easy, as the canoes had to be manhandled down some steep steps beside the bridge. The weather on the first day was grim! Very wet and quite cold. 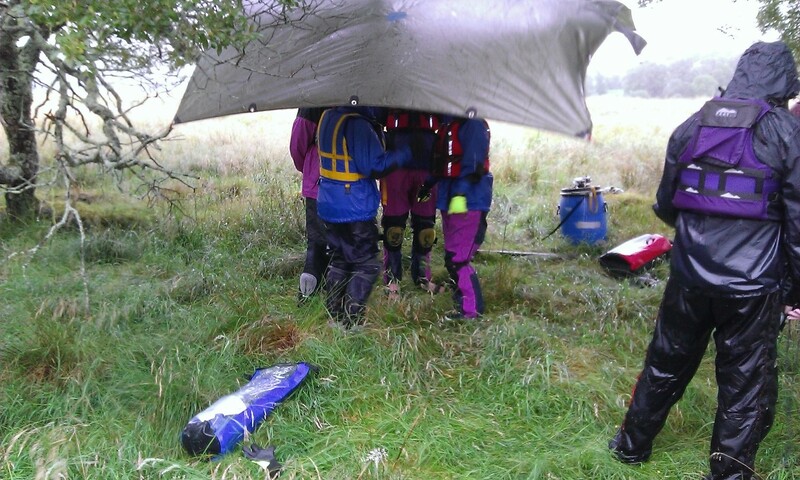 For lunch we landed and huddled beneath a tarp. Fortunately, the weather improved a bit on subsequent days, although it seemed to rain a lot of the time until the fifth day (Friday). 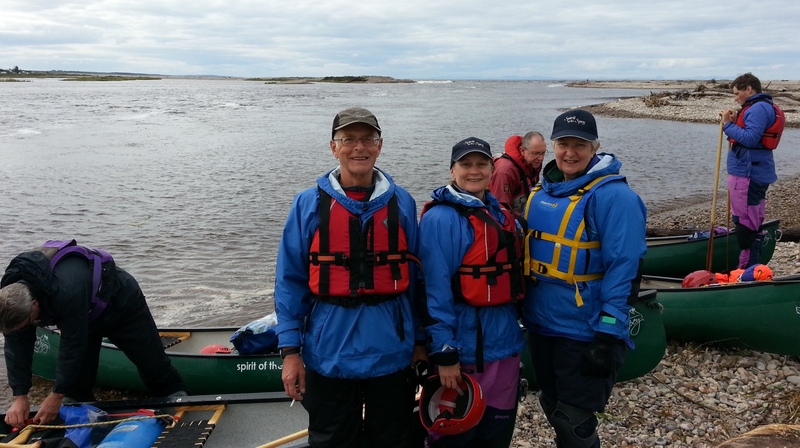 We were three to a canoe on the first day, so that there was one person with a bit of experience in each of them, with Dave, the guide, in a third canoe. Then disaster struck! 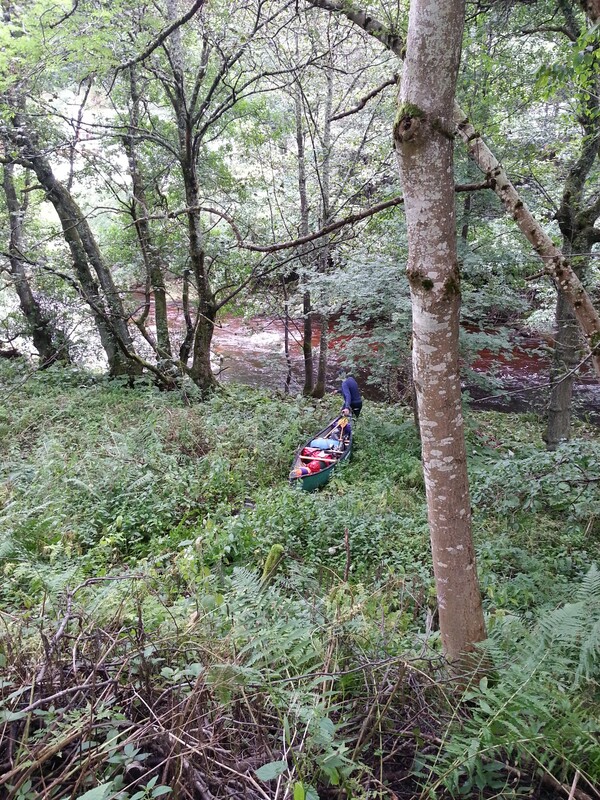 A couple of hundred metres before we were due to finish, just over from Raliabeag, the canoe carrying my sister and the two from Holland was forced into the trees on the south side of the river, their canoe capsized and all three of them fell into the water. Lindsey, Nick and I were near the north bank and quickly grounded our canoe. We looked over and there was the Dutchman (Guus) holding on to the grab rope floating in mid stream, followed by my obviously scared sister, Penny, who had not canoed before, and upstream we could just make out Guus’s son, who had grabbed a branch and was hanging on to the south bank. So, you have the guide who was in front, further downstream, plus two people being carried rapidly down the fast flowing river, and Nick took off along the north bank to see if he could help. You can’t see anything down the river because everything is obscured by trees, so it’s just Lindsey and you. And here is a question for you. You walk upstream until you’re closer to the lad in the water, but there’s so much noise from the river and so many trees on both banks and half submerged by water that you can’t hear anything. He’s looking scared. He can’t seem to get out of the water. What do you indicate that he should do, by sign language? There’s a right answer and a wrong answer. I got it wrong. I’ve added the following titles to JournalTOCs, the free current awareness and alerting service for researchers, students and lecturers. JournalTOCs now contains details of the latest Tables of Contents of over 24,500 scholarly journals, including more than 7,800 Open Access journals, and is the largest freely available collection of scholarly journal Tables of Contents. 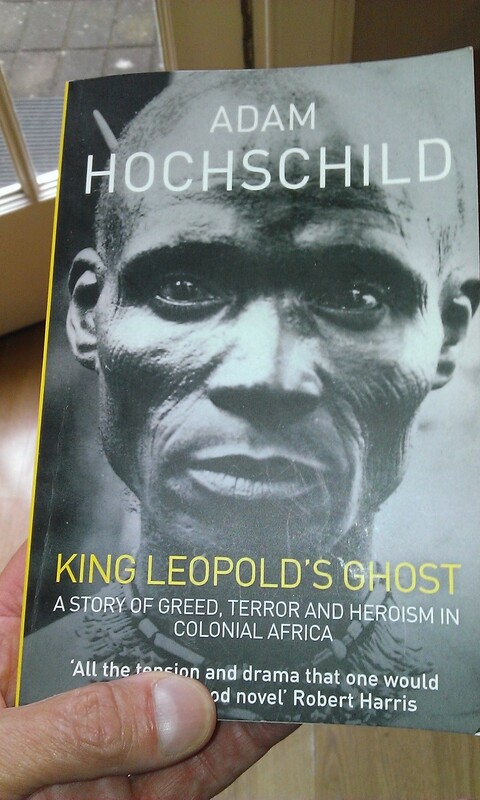 King Leopold’s Ghost, by Adam Hochschild, is the story of Belgian involvement in the Congo under the auspices of King Leopold II. More than 600,000 copies of the book have been printed. It turned into one of the worst examples of colonial exploitation, with production of rubber based upon hostage taking and forced labour, and the result was a decrease in population of possibly ten million. What happened became the inspiration for Joseph Conrad‘s Heart of Darkness. I had not realised before reading this book that Wilfred Thesiger had been British vice consul to the Congo, and had reported back to London about the starvation and brutality that he found.